It’s one of the major Italian, if not European, events on the cultural calendar. Held annually in Venice, the Carnevale di Venezia (Carnival of Venice) ends a day before Ash Wednesday and is famous for its ornate, elaborate masks that colour the city. History books have it that the Carnival of Venice knows its origins from a military victory of the Serenissima Repubblica in 1162, following which people started to dance in the famous San Marco Square to celebrate this feat. It was banned by the Austrian King in 1797 and returned officially in 1979 after the Italian government decided to bring back some lustre to Venice’s culture and history and bolster tourism, as approximately 3 million tourists flock to Venice yearly to participate in this Carnival. There are different types of masks, all of which used to be worn by people who had different occupations, and there’s also a yearly contest to decide the most beautiful mask of the carnival. The Venetian Magic has landed on our online casino thanks to this online slot from Side City Studios, capturing all the fun and glam of this yearly festival. The gondola’s leaving – come on, hop in! 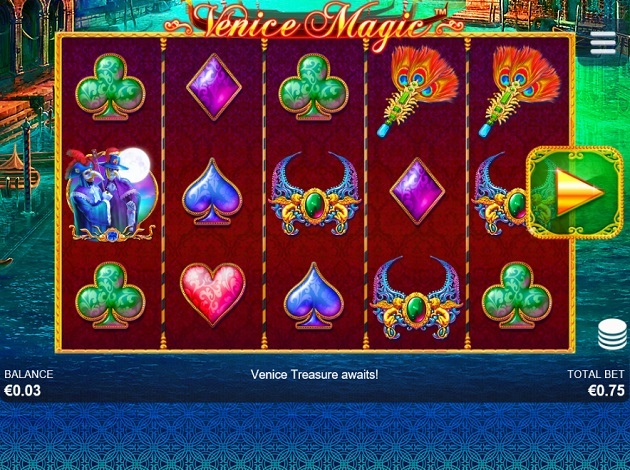 Venice Magic comes with five reels and 25 paylines, and a theoretical RTP of 96.18%. Put on your mask and bet from as little as € 0.25 up to a maximum of € 125. Besides these more than affordable betting limits, Venice Magic comes with its own interesting set of bonus features, as we shall see right now. The Zodiac Wheels Feature is triggered when at least 3 Zodiac Wheels symbols land on reels 2, 3 and 4. The Zodiac Wheels will then pop up to determine the number of Free Spins you will receive – you can get 5, 6, 7, 8, 10 or 15 Free Spins – and a win multiplier of 2x, 3x or 5x. The Zodiac Free Spins are played on a different set of reels albeit at the same pay amounts, and the Zodiac Wheels cannot be awarded during the Free Spins, meaning the mode cannot be retriggered. The other important feature in Venice Magic is the Venice’s Treasure, where two different types of Wilds can appear at random at any point during the base game. The Joker Wilds will double the payout from any winning line in which it substitutes to form a winning combination, but each winning line with a Joker Wild can only be doubled once. One to four Joker Wilds is placed at random at the start of each spin. On the other hand, the Tower Wild (symbolised by the Campanile di San Marco) covers an entire reel, maybe two, and turns it into a combination-forming Wild Symbol. A coloured mask is up next with a slightly higher maximum payout of 25x for five of a kind and 15x for four, while the minimum amount remains the same. The feather symbol earns you 10x for 3 of a kind, 20x for four, and 30x for five of a kind. The red mask stands at a maximum of 40x for five of a kind, then the blue one at 75x for five of a kind (starting with a minimum of 25x for three hits and 45x for four), before the green mask with 30x for three of a kind, 50x for four and 100x for five. The highest paying symbols are the masked woman with a 500x maximum payout for five hits on the reels, while 4 hits pay you 100x and 3 hits pay you 50x; and the golden Lion of Venice, with a minimum payout of 100x for three of a kind, 200x for four and a whopping 2500x your bet per line for five of a kind. A golden set of reels framed against a dark red tapestry, containing colourful symbols all of which fit in a seamless manner within the Carnival atmosphere. Side City Studios have worked hard at reproducing the allure of the Venetian Carnival in all its glitzy splendour, while providing players with a clean game interface which is also quite user-friendly. The gondola to Venice Magic awaits you. The masks are on and the fun has just begun around you. Spin away at this truly magical online slot by Side City Studios, and get ready for a truly breathtaking experience! Emphasising on high quality, premium graphics, unique mathematics, versatile solutions, and an ability to offer games internationally is something that is key to becoming a reliable and well-liked game supplier with followers always coming back for more. All of this, and then some, Side City has and offers – and it is why we are so thrilled to have them with us. What is Side City Studios? Side City Studios is a company established in 1999 and is one based in the Canadian city of Montreal. This was the start of a third party developer game studio for land-based, online, and social gaming markets based in Montreal, Canada. It is a company focusing on providing everything from immersive solutions, to high-quality games, and high performing content for gaming overall – all of this offered to the biggest gaming operators in the world today.